Red Dragon igniters are great for remote firing of your fireworks! 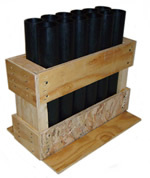 HDPE mortar tubes are the best and industry standard for shooting your fireworks out of! All of our HDPE tubes are plugged and stapled. 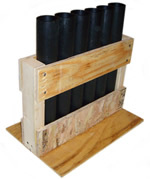 Mortar tubes are to be used and securely placed in a well-built mortar rack. All of our tubes are plugged with a solid 1.5" thick wood plug. The most common and most universal fit for consumer shells is the DR11 12" mortar tube. 12-shot consumer mortar rack. Comes with 12 HDPE DR11 15" long mortar tubes. Mortar tubes are plugged. For use with all consumer firework mortar shells. 6-shot consumer mortar rack. 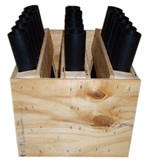 Comes with 6 HDPE DR11 15" long mortar tubes. Mortar tubes are plugged. For use with all consumer firework mortar shells. 18-shot consumer mortar rack. Comes with 18 HDPE DR11 15" long mortar tubes. Mortar tubes are plugged. For use with all consumer firework mortar shells. 36-shot consumer mortar rack. Comes with 36 HDPE DR11 15" long mortar tubes. Mortar tubes are plugged. For use with all consumer firework mortar shells.